Aviation being a dynamic sector attracts the technical innovation at first hand. There are new entrants in air traffic management (ATM) market providing cost effective, innovative and efficient technologies to control and manage the air traffic with gradually making airspace boundaries less dependent on national boundaries. With the shift in demographics of emerging markets of the world, air services are expected to grow as a commercial service and ensure global interoperability and harmonious operations. Goldstein Research analyst forecasts the air traffic management market size is set to reach USD 99.28 billion by 2024, registering a CAGR of 11.56% over the forecast period. Expansions of aircraft manufacturing industry along with the upcoming technological advancements are the two key factors which are triggering the growth of air traffic management market. The report covers the present ground scenario and the future growth prospects of the air traffic management market for 2016-2024 along with the statistics of its application in various segments. We have calculated the market size and revenue share on the basis of revenue generated from the major players and total sales of air traffic management components across the globe. The rising trend of advance technology based air traffic management systems in developed nations such as United States, Australia are triggering the sales of the air traffic management system equipment. On the basis of these aspects, we have forecasted the global air traffic management market till 2024. On the basis of domain, air traffic controllers (ATC) have the highest share in air traffic management system due to gradual increase in air traffic and addition of bulk of travellers from across the globe. Air traffic with respect to year 2015 has increased with 6.8% in 2016. Other than ATC, application of air traffic management in communication is also leading due to its vital importance between air traffic controllers and pilots for control operations, thus leading to development in equipment technologies of direct communication channels at different radio frequencies. Air traffic management Market Outlook 2016-2024, has been prepared based on an in-depth market analysis from industry experts. The report covers the competitive landscape and current position of major players in the air traffic management market. The report also includes porter’s five force model, SWOT analysis, company profiling, business strategies of market players and their business models. Global air traffic management market report also recognizes value chain analysis to understand the cost differentiation to provide competitive advantage to the existing and new entry players. According to the report, major driving factor for expansion of global air traffic management market are the enhanced construction projects of new airports, renovation of the existing ones, aircraft movement, and heavy passenger and freight traffic has led to the innovation and growth of the air traffic management systems. Expenditure on global airport transportation in 2015 was USD 55 billon which increased to USD 64 billion in 2016 showing the need of expansion and parallelly the need of air traffic management system. .
Further, the major challenge this industry is facing is the regulatory norms as per the different regions of the world. For instance in Europe, before investing in this market there is a need to have full knowledge of the market, which can be obtained from various bodies working in parallel, but they adds complexity, waste of resources and efforts regarding supply of necessary reports. Few such bodies are APATSI project board for air traffic services, Joint Aviation authorities, EUROCONTROL and ICAO European regional authorities for air traffic management. Based on geography, North America dominated the air traffic management market owing to the maximum number of air travellers which are 822,949 passengers alone from US, it requires larger number of aircrafts to fly and to manage them through air traffic management system. Whereas, Asia-Pacific is an emerging market for the air traffic management system, due to the technological development and increased government spending on aviation sector which has resulted in USD 7.3 billion profits in 2016 from APAC. 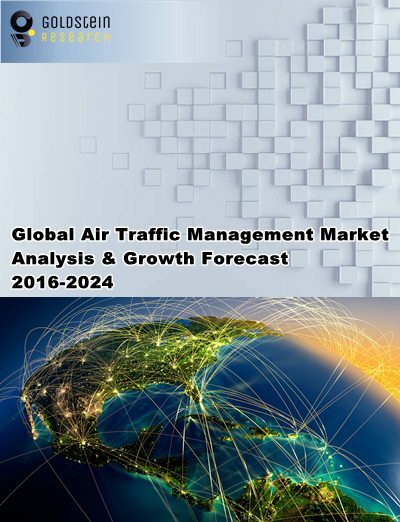 Our global air traffic management market report comprises of the following companies as the key players in the air traffic management market: Thales Group, Aquila, Aeronav Group, BAE Systems PLC., Comsoft Solution GmbH, Harris Corporation, Honeywell International Inc., Lockheed Martin, Frequentis. Other high-flying vendors in the air traffic management market are: Indra Sistemas S.A., Northrop Grumman Corporation, Raytheon, Saab AB, Intelcan Technosystems, Searidge Technologies, Adacel. The study was conducted using an objective combination of primary and secondary information including inputs from key participants in the industry. The report contains a comprehensive market and technological landscape in addition to a SWOT analysis of the key players. What is the total market size by 2024 and what would be the expected growth rate in the future? What is the revenue of air traffic management market in 2015-16 and what would be the expected demand over the forecasted period?